You have started a brand new stage in your lives, opened a challenging yet invaluable page in your book of life… After your baby’s birth-especially when he/she is the first child- you might feel a little surprised, exhausted, going through psychological and physical imbalance. Doing yoga at home with your baby can help you regain back your internal harmony, strength, flexibility and balance in no time, without having to leave your baby behind while you are exercising. This special time that you spare for yourself and your baby will also help you relax, restore your mental and spiritual balance and help overcome your baby’s sleeping difficulties and any possible digestive problems. 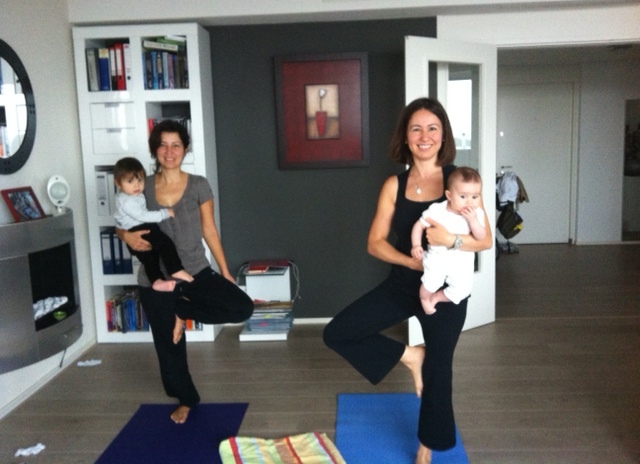 We wish you and your baby a healthy and happy life full of yoga! You can start mom & baby yoga whenever you feel ready. The best time to start is the second or third month after baby’s birth, until she/he crawls or walks. What kind of environment are you going to create? Create a safe, comfortable environment for yourself and your baby where you are not going to be disturbed. Lay down a yoga mat or non-slippery sheet, take off your shoes and get a few of your baby’s toys and plenty of water for you and your baby. Practice with a soft, relaxing music that will help soothe your nervous system. Switch off your phone! Try to eliminate all the external factors that might cause disturbances for you and your baby. Just ‘be in the present’, right here, right now! What about the breathing and the poses? Do not hold your breath while you are in the yoga poses! Breathing must flow naturally and through your nostrils throughout your yoga practice. Breathe in and out slowly, deeply, continuously and rhythmically. Practice Yoga asanas (poses) on both sides of your body to balance your left and right side of the body & brain. Also, practice the complimentary poses following the right sequencing of the asanas using the sample yoga program. At the end of your yoga practice, lie on your back with your baby on your tummy and practice deep relaxation by relaxing each body part for at least 5 minutes. *Mom & baby yoga program consists of postures designed especially for you, more than your baby. Please talk to your MD before starting this program. If you have any serious physical or mental disorders, or you do not feel ready, do not practice yoga. A: Suitable poses for moms with 3-6 month old babies. B: Suitable poses for moms with 6-12 month old babies. Sit in a relaxed cross legged position, back straight, shoulders relaxed, your baby lying or sitting on your lap. Close your eyes and start following and observing your breath. Breathe in and out of your nostrils slowly and deeply. Focus on your body, every part of your body…Prepare yourself physically and mentally for your yoga practice for a few minutes. Start practicing with neck rolls and shoulder shrugs. AB-Butterfly: Soles of your feet together, your back straight, sit with your baby between your legs.Lay down your baby with her/his back on the floor and head on your feet. Breathe in while straightening your spine, exhale and bend forward with your neck and back long, holding your feet with both hands. Hold the pose with normal breaths, relaxing your neck and head over your baby’s tummy. AB-Baby’s feet-tummy and stretching arms: Sit in a cross-legged position again. Or you can sit on your knees as well. Lay down your baby on the floor in front of you. Start massaging soles of your baby’s feet with your thumb. Bend your baby’s knees to her/his chest, creating a mild pressure to stimulate the digestive system and massage her/his tummy with clockwise circling motions.Hold your baby’s hands, open arms to the sides and cross her/his arms over the chest both ways a few times. AB-Seated twist: Sit in a cross-legged position with your baby on your lap. Your left hand holding your right knee, turn to your right side, gaze backward over your shoulder, putting your right hand on the floor to support your spine. Hold the pose with normal breaths, then come back to your center, rest a while and do the other side. Stand on all fours with your knees, your hands flat on the floor underneath your shoulders. Exhale while touching your chest with your chin and making a hunch on your back. While raising your head, look up and lower your back, while relaxing your shoulders. This practice will give you flexibility on your back, spine and neck muscles.ow stretch your arms forward, sit on your heels and relax your forehead on the ground. Relax your whole body, especially your back. Close your eyes and breathe in and out deeply while in ‘child’s pose’. AB-Head to knee pose: Sit with legs together, long forward. Keep your back straight open your legs apart and fold right leg and put the sole of the foot on your left leg’s inner thigh. Lay your baby’s head on your knee, his/her back on the floor. Hold your baby’s tummy with one hand and with the other hand holding your foot, breath in and while exhaling slowly bend forward. Hold the pose while breathing slowly and deeply. Repeat the pose with the other leg. AB-Forward bend: Sit with legs together, long forward, your back straight. Lay your baby on your legs. Hold your baby’s hands, breathe in and while exhaling slowly bend forward, without hunching too much. Hold the pose while breathing slowly and deeply. Then while you are breathing, straighten your spine and come back to the sitting position.As an alternative, if your baby can sit, make her sit on the floor, hold her/his hands, soles of your feet touching her/his tummy. Again, breathe in and while exhaling slowly, bend forward. Hold the pose while you breathe slowly and deeply. Next time when you breathe, straighten your spine and come back to the sitting position. B-Baby rolls: Put down your baby on your legs sideways on her/his back and help her/him roll on your legs towards you! AB-Resting time: It is time to take five and take care of your baby’s needs now! Stand up straight, your baby resting on her/his back between your feet. Lengthen your back, spine and neck. At the same time, feel soles of your feet and your toes pressing down strongly on the ground. Strong and active legs, arms by your side, tummy in, shoulders soft. Feel grounded from waist down and lengthen your spine and head towards the sky…Close your eyes and breathe…You are strong, stable and balanced just like a mountain. Lay your baby on one of your arms holding her/his tummy and start swinging from side to side slowly. Let her/his arms and legs hang from your arm as like a baby leopard hanging from a tree. Legs apart, feet strongly rooted to the ground with your weight evenly distributed to both feet. Hold your arms open and parallel to the ground. Turn left foot to the side. Breathe in and while exhaling bend to your left side, hold your left leg with your left hand and look up to your right palm, keeping your chest open. Hold the pose while breathing normally, look at your baby and then tickle her/him with your left hand. Repeat the pose to the other side. AB-Warrior II:Legs apart, feet strongly rooted to the ground with your weight evenly distributed to both feet. Hold your arms open and parallel to the ground. Turn one foot to the side and bend the knee of the turned foot 90 degrees. Look at your bent knee side, gazing your eyes on your middle finger. You are balanced, focused, strong and stable as a warrior. Repeat the pose on the other side. This pose develops balance, concentration and helps to strengthen legs, arms and back. AB-Warrior I: Stand with legs apart, pressing your feet firmly on the floor, arms open to the sides. Rotate one foot to the other side and bend the knee about 90 degrees. Now, rotate your hips also in the direction of your bent knee. Put your arms all the way up touching your ears. You are now in full balance pressing the floor and reaching out to the sky with your head and arms.You can do this pose by holding your baby in your hands! You are standing tall at the mountain pose, pressing both feet firmly on the floor; arms on your side, your back, neck upright. You are as strong and powerful as a mountain. Your hands will open to the sides for balance. Put one foot up to the inside of your opposite thigh as high as possible with the other foot firmly on the floor. Hold your look at a point in front of you and raise your hands up slowly. Now you are a beautiful tree with sound roots in the ground, with branches (the arms) and green leaves (your fingers) reaching the sky! This is an ideal pose for flexing the pelvis and to promote balance and concentration. Get ready at the cat pose, your baby lying on her/his back on the floor right underneath you.. Then lift your hip upwards, pressing your palms and fingers down on the ground and relaxing your neck and head towards the ground. Make sure you stretch and straighten your back, spine first, and then try to push your heels down as well stretching your hamstrings. You can adjust your body by moving your feet a little forward or backward if necessary. Dog’s pose is one of the best asanas to activate and stretch whole body. Hold the pose for a few breaths and then rest in child’s pose. AB-Plank pose: Get ready in cat pose. After getting into dog pose, lower your hips down until your arms are straight and right under your shoulders with your body straight from head to toes. Rest your whole body on the floor after you hold the pose for a few breaths. AB- Cobra pose: Lie on your belly and put your hands on the floor slightly in front of your shoulders. As you inhale, you lift your chest, head forward and up from the floor but make sure your neck is relaxed. As you exhale, you put your head down and rest on the floor. This is a good pose for flexing especially the spine and the back. AB-Locust pose: Lie on your tummy, your arms and palms on the floor by your side. Inhale and lift your whole body except your tummy and pelvic bones. Do not bend your legs or arms. Hold the pose breathing normally, relax at the next exhalation and then repeat a few times. Lie on your back holding your baby from under arms, facing you. You can bend your knees. Breathe in and start lifting your baby up and when exhaling down towards your chest. Repeat the movement a few rounds. Sit on the floor with your knees bent and feet on the ground. Place your baby’s tummy on top of your lower legs, hold her/his hands tight. Slowly, using your abdominal muscles, lift your feet and legs off the ground and start lying down on your back. Once your back is on the ground, start moving your legs up and down and fly your baby on your legs, holding carefully. Once in a while, lift your head up and give her/him a kiss if you can. Rest with your baby on your tummy when you complete the practice. This is a very good pose for both your abdominal, back, legs and hip muscles, also good for concentration and balance. Lie on your back and bend your knees. Keep pressing your feet on the ground and keep your feet and knees parallel to each other. Hold your baby on your tummy either lying down or sitting. Breathe in and raise your hip and whole back up and hold the pose for a few breaths. Put your hip and back down and relax for a while. Repeat the movement a few rounds. Every time you breathe in, fill yourself with positive energy, positive thoughts and emotions, with love, peace, serenity. And every time you breathe out, let go of all the negative and excess energy, get rid of all the burdens you have been carrying with you and open your heart for whatever your life will bring you, open yourself to all of the new experiences.Enjoy the deep relaxation mentally and physically. Your soul is in harmony with the universe, is peaceful and in unity. After relaxing in Savasana, holding your baby, come up to a sitting position slowly, breathing naturally. Wish and send health, peace and love to yourself, your baby, your family, all of your loved ones, all beings in the world. When you are ready, you can open your eyes.We wish you a brand new life and healthy days full of joy… Namaste! *I would like to thank my dear friend Özge Güven and her baby son Can for modeling for this section, and her husband Gökhan Güven, for taking these wonderful pictures! *Please see the pictures here!